Author Loe Beerens, a veteran photographer on the international concert scene, relates his experience in and knowledge of all the important aspects of planning and photographing concerts of all kinds. From punk to classical and everything in between, Loe covers how the music industry is organized, how to get access, the right people to befriend, and the proper etiquette of concert photography. From preparation to equipment selection, the reader will learn how to make the most of those three songs from this richly illustrated book. Shooting techniques for each of the major musical instruments are covered, as well as capturing the peak action, post-production techniques, shooting in low light, and marketing your images. Whether you are a photography enthusiast, a working professional, or just a lover of music, you will benefit from this informative guide. Since the day he became a photographer in 1980, Loe Beerens have been fascinated by music photography. In those days he photographed music legends in the early stages of their careers such as Ike and Tina Turner, Thin Lizzy with Phil Lynot, Anne Lennox in The Tourists, Little Feat with Lowell George, Rod Stewart and the Faces, Van Halen with David Lee Roth, the first festival gigs of the Police, the debut tour of Dire Straits, and so on. In the mid-eighties he stopped working full-time with professional photography to work in the music industry as artist manager and artist promoter. The only pictures he made in this period were of artists with whom he worked. Since 1995 he has returned exclusively to professional photography and became the photographer for Universal Music The Netherlands. 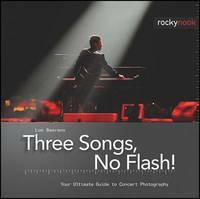 Marco Borsato, Guus Meeuwis, Trijntje Oosterhuis, Lionel Richie, Live, Laura Fygi, DeeDee Bridgewater, and Toots Thielemans are among the artists for which he has created CD and DVD artwork photography. Loe has also opened his own studio and works as a freelance photographer/photojournalist with experience in a wide variety of photography including public relations, advertising, press and magazine photography, events, corporate, annual reports, photos for websites, and portraits.